‘Again, the kingdom of heaven is like a net that was thrown into the sea and caught fish of every kind; 48when it was full, they drew it ashore, sat down, and put the good into baskets but threw out the bad.49So it will be at the end of the age. The angels will come out and separate the evil from the righteous 50and throw them into the furnace of fire, where there will be weeping and gnashing of teeth. Captures everyone. After three weeks sick leave, it appears I will be able to return to my parishes next week. I am ambivalent about this, and feeling very disconnected. We say such fine things about the Kingdom of Heaven; how in the end, all that God desires for Earth and for the Universe will be brought into being. The leopard will lie down with the lamb. And in the meantime, in the now but not yet, we of the church are people of God, the embodiment of Christ. We are where the Kingdom is beginning to take shape; it is among us. Yet church too often reminds me of a suburb where I once stayed. All the houses were timber framed galvanised iron; built in poverty. In many cases, in an attempt to make these houses look like something they were not, people had clad the front with faux brick or stone; pressed steel sheets that supposedly look like brick. You nail it over the front of the house. So often the church feels like that. We put up this theological cladding pretending to be something we are not. We have aspirations to Kingdom, but we look like a fake. Look at the minister in my congregation, for example; I need say nothing about the rest of the people. He has no idea where things are going, or what might be done to turn things around. He’s out of ideas and low on energy. Didn’t Oscar Wilde say most ministers live lives of quiet desperation? 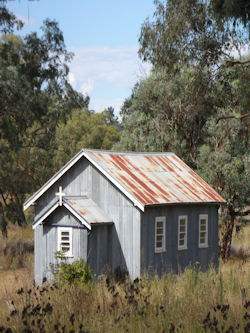 His ministry feels, to him, not like leading a fine household of God, but struggling in an old tin shed with a faux front. It is true that Jesus describes the kingdom in glorious terms. “... the kingdom of heaven is like a merchant in search of fine pearls; 46on finding one pearl of great value, he went and sold all that he had and bought it.” It is something for which to search and give everything. But much else of what he said about the kingdom describes an ambiguous, even slightly suspect phenomenon. In contrast to such mighty trees, said Jesus, the kingdom of heaven is more like a mustard seed. True it will grow be a tree, but this is not what you expect from mustard. It is a herb with a tiny seed. And in the first listeners’ minds is the knowledge that mustard presents a problem of cleanliness and purity. This thought continues because... ‘The kingdom of heaven is like yeast that a woman took and mixed in with three measures of flour until all of it was leavened.’ The Greek says, like leaven that a woman took and hid... until all of it was leavened. Leaven, hiding rather than kneading, and the woman herself are all subversive images. The first listeners would expect the glorious and pure kingdom of heaven would be un-leavened, that nothing would be hidden, and that the actor would be male. What sort of kingdom is this, with all its impurity and muckiness? It’s a kingdom like a treasure hidden in a field, which someone found and hid; then in his joy he goes and sells all that he has and buys that field. It is worth all we have, although some might question if the person buying the field is doing something underhand. Again there is a subversive undertone to the image. And then we hear just how strange this kingdom really is. The net does not catch fish of every kind as the NRSV says, it is a dragnet which “gathered of every kind,” (KJV) every species, which would include much which is unclean. This is reiterated in the story of sorting and judgement. So, in this thirteenth chapter of kingdom parables, we see a kingdom sown spendthrift in the parable of the sower, polluted by deliberately sown weeds in the parable of the tares last week, and now, suspect in its purity, with much that is unclean within it. This is the same Kingdom of God which is a pearl of great price, and a treasure for which it is worth giving everything we have. We ought not clad ourselves with fine pretensions and pretend to be more than we are, for the kingdom is not the fine house we might have imagined, or the comfortable place we may have desired. But I am reminded of the first church built by one congregation where I was minister. It literally was a tin shed. They called it “Little Tin Glory,” and so it was, because there the good news of Jesus was preached. So as I go back to work, it really is part of the kingdom of heaven, with which I will seek to reengage. This is despite my feeling lost as I struggle to nurture our mustard seed enterprise. 48when it was full, they drew it ashore, sat down, and put the good into baskets but threw out the bad.49So it will be at the end of the age. The angels will come out and separate the evil from the righteous 50and throw them into the furnace of fire, where there will be weeping and gnashing of teeth. 51 ‘Have you understood all this?’ They answered, ‘Yes.’ 52And he said to them, ‘Therefore every scribe who has been trained for the kingdom of heaven is like the master of a household who brings out of his treasure what is new and what is old.’ 53When Jesus had finished these parables, he left that place. Like so much of life, a religious practice that seeks to find a way between denial of evil, and unnecessary condemnation, is a difficult and costly art. Surely after 2000 years we can see the dangers and fruitlessness of enacting judgement ourselves, and the contradiction of the notion of God’s love that is inherent in imagining that God will consign people to hell. Even the early church saw this. All the above is not quite the digression that it may seem. Our text this week finishes with this strange saying of Jesus: Therefore every scribe who has been trained for the kingdom of heaven is like the master of a household who brings out of his treasure what is new and what is old. If the kingdom is only an old treasure, it may be nothing more than a dead tradition, a history lesson, something passe and taken for granted. If the kingdom is only a new treasure, it may be nothing more than a passing fad, a sudden infatuation, something that has no depth. The treasure of the kingdom is as old as the power of God working in the creation of the world; God's calling of Abraham and Sarah; God's leading the people in the Exodus; God using Cyrus to free his people from Babylon; God's earthly presence in Jesus Christ; God's actions in the saints of old including the apostles and Martin Luther. The treasure of the kingdom is as new as hearing the stories of God and God's love for us today. It is as new as falling in love with God again today. It is as new as God's power living in our lives this very minute. It is as new as Jesus coming to us in bread and wine. As we seek to be faithful followers of Jesus it is the treasuring of the old, and the recognising of new pearls, which will transform our old tin sheds into little tin glories. The question for me is not whether I can see the way forward, not whether I have a plausible plan for the future, and not whether our numbers are growing. It is whether I am treasuring the faith and seeking its new expression, discerning mustard seeds, and recognising the godly contradiction of holy leaven, as outlandish as it may seem. Then I am a scribe trained for the kingdom of heaven.